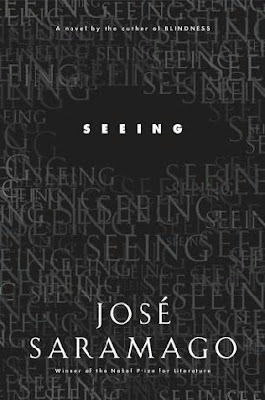 5 months ago, I read Blindess by José Saramago. I found that book extremely awesome and moving, that I decided to grab the sequel and read it as well. Thus, one day, I went to the library and borrowed this book. So, this book picks up four years from where Blindness ended. There is an election, and the country has three parties. One rainy day, the election was conducted, but the capital faced a democratic crisis: more than 85 percent of the votes have been blank. So they decided to conduct it again a week later, and lo and behold, the same result was garnered, that the huge majority of the votes were blank. The government then became worried about this anarchy-like tendencies. They decided whether to split it between the parties, and other tactics designed to scare the public away were implemented. They were basically worried because the blank votes essentially meant that the public do not support their government anymore. So the government decided to abandon the city, scaring the people into thinking that anarchy would be devastating, planting guilt into their lives. But all the methods so far do not work, so the government resorts to dirty business, planting bombs and burglarizing the houses to make a point that a government is essential. In the latter half of the novel, characters from Blindness appear again, with the doctor's wife emerging as the main suspect for the perpetrator of the blank vote movement. They eventually decided that this was due to the fact that she did not go blind four years ago, and therefore she must be the one to blame for the current crisis. There is a whopping fallacy here, and I am so angered by the villainous government that Saramago portrays here. In the end, tragedy ensues, and as always, Saramago succeeds in painting a dystopian world that is meant to give us a warning against scenarios that might occur should one not keep ourselves in check. I always like the premises that Saramago chooses for his novels. In Death with Interruptions, he discussed the idea what if death ceases to occur. In Blindness, it was the what-if scenario of everyone becoming blind and reverting to animalistic tendencies. Here, it is the scenario of people exercising their right to a blank vote and the anarchy and governmental control that might occur due to that. In short, this is a very good book, and I wholeheartedly recommended this to anyone. 5 out of 5 stars.